Indoor management of spiders may involve nothing more than vacuuming up the spiders and their webs and egg sacs. Removing clutter and taking other sanitation steps directed at conditions favoring spiders indoors, around the home, or around the landscape are necessary to help reduce spider problems. Thorough inspections are necessary to find all these spider harborages for later sanitation, removal or insecticide treatment. Long-term residual control of spiders is difficult to achieve. If spiders are established indoors or if outdoor species are migrating indoors, residual applications can be used. All areas of where the spiders have been found should be treated, paying particular attention to dark corners. Outdoor treatment with residual pyrethroids may be necessary to control spiders migrating inside or to eliminate spiders around porches, under eaves and in other areas on the outside of a home or building. 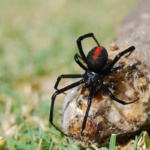 For some venomous species, such as the Black Widow, insecticide applications may be necessary in landscape areas such as foundation plantings or rock gardens.